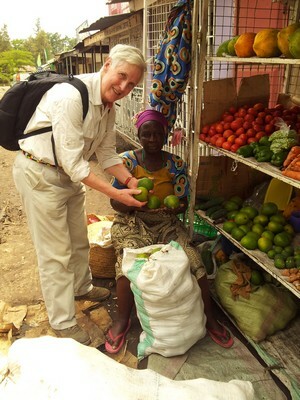 Our CEO continued his visit to Tanzania, this time heading to the markets to meet more of our grant and loan recipients. If you’ve missed the earlier blogs, catch up on Part 1 and Part 2. Today we are in Usa River, a flourishing township 30 miles east of Arusha on the Moshi road.Â Usa River is hugely spread out and a long dusty road stretches as far as the eye can see. Scattered dwellings are thrown together on both sides with acacia trees bringing spasmodic shade. Squatting beside her charcoal brazier in one such oasis of shade is Veronica. 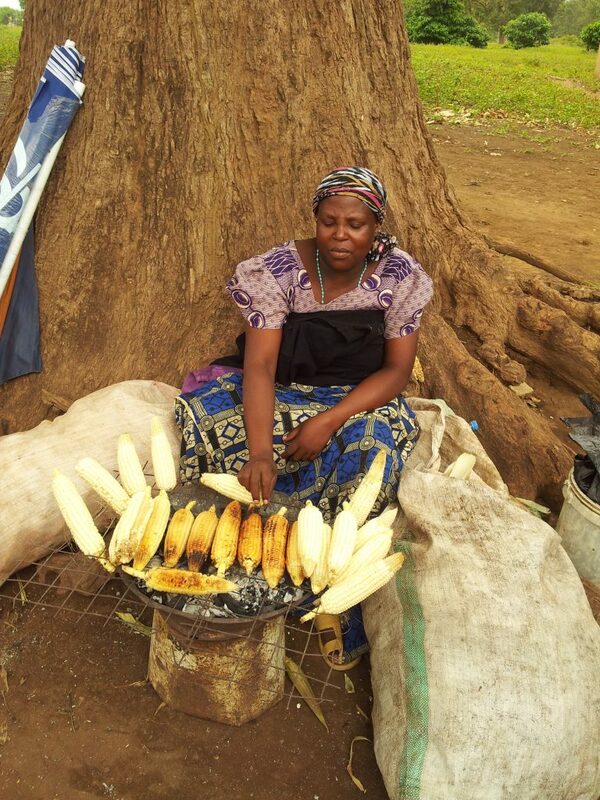 A recent grant recipient, whose business is grilling corn, Veronica reports a steady flow of customers during the day for whom the grilled corn provides a welcome snack. It’s not big business, but Veronica is happy with the way it is going. Above all, she is working, is independent and manages to look after her three children (aged 11, 8 and 3) better than before. Too soon to know how it will develop but for now, Veronica is a happier lady! Our Community Counsellor in Usa River is Mr Ruby. A lean, rather distinguished looking gentleman, he guides us around the various grant recipients with good humour and courtesy. He has been unwell for some years but always makes the effort to visit his fifty or so Mondo clients. He knows them well and they speak highly of him. Even during periods of illness he has managed his fortnightly visits. Me with Ruby and Erneth after a long days work! This is a strongly agricultural area and most of our small businesses are selling vegetables of one kind or another. One of our original recipients, Asha, sells potatoes and has built her business up very impressively, selling to three large markets in the region. She started with £100 of stock and later borrowed £200 to invest in her own production. She now employs two other ladies. A complete contrast was the hairdressing salon we visited in a small side street. It is run by Rachel, whose grant of £100 we authorised six months ago. Rachel has converted a smallish room into an attractive salon, with two driers and a welcoming waiting area. I liked the way she had decorated the walls with pictures of varied hairstyles. Whilst normal in UK, few salons in Tanzania seem to bother with these important accessories. Mr Ruby took us to see several other recipients and we ended at a Mama Lishe, a home based cafe, which Ernuda was preparing rice and beans for her clientele. Her daughter, Mary, has just finished a degree at university in Dar es Salaam. This would have been inconceivable a few years ago, before our small business grants started. 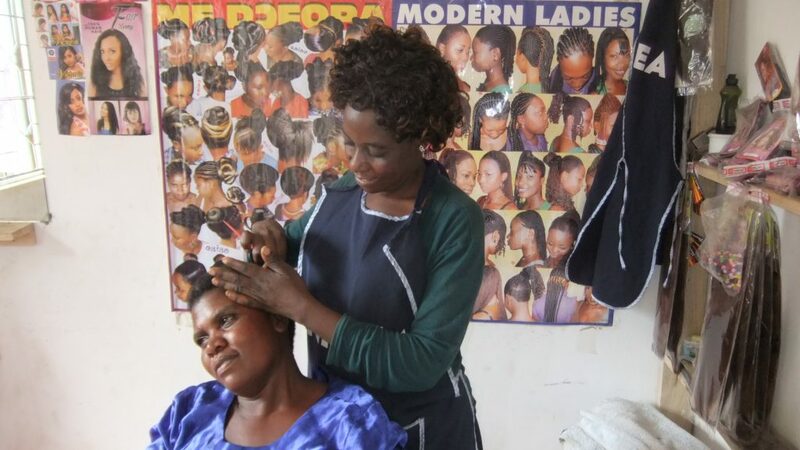 While looking for a job, Mary helps her mother and they are thinking of ways to expand their operation. As ever Mr Ruby will be guiding them. Our Community Counsellors are what makes the difference between pure sustainability and real growth, creating long lasting businesses that can pass to the family if the original recipient is ill, or dies, as some sadly do. 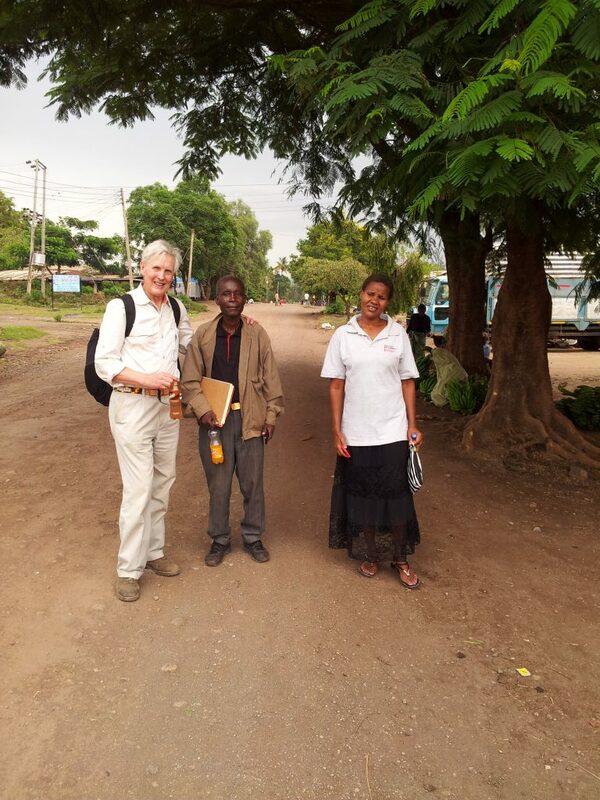 On return to Arusha, we interviewed two candidates for the Liaison Officer post. One might be a possible. This is a key role as we develop the programme.